Ireland's highlight reel TD's didn't let up with the move to Portugal - they added another 14 points to move ahead 35-12. Netherlands' special teams work - they're 2-for-2 on extra point kicks so far - accounts for their slim 14-12 lead over Puget Sound. With back-to-back 100+ yard quarters, Great lakes pulled ahead of England 32-20. Great Lakes racked up an impressive 250 yards on 12 carries/completions in the first half. That's nearly 21 YPC! 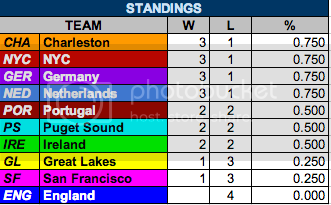 New York holds a 4 point lead over San Francisco, while Germany leads Charleston by 8.
could i get them re sent pls. wrisky50 will be skipped this quarter and his teammates asked to fill-in. The triples game is forfeited in favor of Netherlands. Great Lakes ended the 1st half with 250 yards and started the 2nd with its strongest effort yet - a remarkable 170 yards and 3 TDs to put themselves ahead 50-27. England also scored and added an extra point, but they'll need a miracle comeback to pull off their first win of the season. Ireland also started off the 1st half with a scoring frenzy, but Portugal shutdown the highlight reel TDs and made Ireland work for their 6th TD... they racked up 140 yards to move ahead 41-15. Portugal - who failed to score a TD, but did manage a FG - seem to be headed to a 2-1 record. Despite their QB missing the quarter and forfeiting 2 extra points, Puget Sound still managed to edge ahead of Netherlands 24-21. Last week's MVP Willo.Kings has been held to 10 yards and 1 TD for the Sound, but Full Metal J stepped it up in the 3rd, rushing for both TDs. Charleston tacked on another TD and kept Germany out of the end zone, but ceded its 3rd consecutive kick. After kicking 6/6 to start the season, Charleston whiffed on its last 5 attempts. Special teams may decide this matchup. San Francisco ended the 1st half with a promising 140 yard, 1 TD effort, but was held to just 5 yards and no scores in the 3rd quarter as NYC extended their lead 17-6. Tin Trumpet has your Q4 invites on the way. Please join them or let us know if you'll be unavailable. Thanks. Portugal entered the 4th quarter trailing by 26 points - a deficit they nearly overcame with a remarkable 24 point binge. Had they won their special teams triples match, Portugal would have made a stunning comeback to remain undefeated 3-0, but Ireland squeezed in a field goal to hold on 44-39. Last update, I noted that England needed "a miracle" to pull out their first win over Great Lakes. They came very close with 110 yards and 2 TDs, while holding Great Lakes scoreless in the 4th, but it wasn't enough as Great Lakes held on 50-41 to snag their first victory of the season. The Netherlands scored and then locked it down on defense, edging out a close 28-24 win over Puget Sound. This was neck-and-neck the entire game - a great matchup! 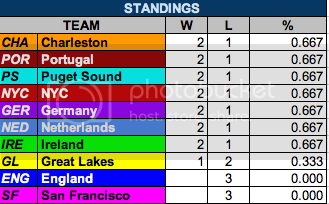 Elsewhere New York City and Germany shut down their respective opponents (San Francisco, Charleston) in the 4th - both teams are now 2-1 on the season. Three teams entered Week 3 undefeated - all left with losses, creating a wide open race in the standings - 7 teams stand at 2-1 entering Week 4. Week 4, Quarter 1 games headed your way soon! If my reading of the spreadsheet is correct, Team NYC has just become the first team to go 10-for-10 in a quarter, winning all 9 of our singles games and the triples game in the first quarter of our Week 4 matchup against Portugal. Welcome elonpuckhog to the Puget Sound roster and to the league - thanks for filling in. Kudos to NYC for breaking a single quarter record - the closest another team has come is 8-10 in a quarter. San Francisco - in desperate need of their 1st win, may have found their scoring edge and hold a slim 3 point lead over Puget Sound. The other winless team - England - can't seem to catch a break. Their previous 3 opponents scored 50, 46, and 45 points each, while the Brits put up a respectable 41, 30, and 36 points in those contests. They trail Germany 24-35 at the break - can they buck the trend? After the entire team set a record by completing 10/10 plays in the 1st quarter, Kondrad set another record in the 2nd, with 3 solo TDs in a single quarter to propel NYC ahead of Portugal 31-13. Meanwhile, Charleston's offensive struggles continued as they trail Ireland 9-3. Great Lakes appears shell-shocked as they stare at a 34-0 defecit. The earlier a game is won, the more yards are gained. Winning a game 5 rounds or less is an instant TD. Totaling 80 yards or more during a quarter is a TD. For each TD scored during a quarter, an extra point is awarded by winners of the triples game. If no TD was scored by the winner of the triples game, a 3 point Field Goal is awarded. The team with more points at the end of 4 quarters wins the match. In the event of a tie, a final triples game will be played to decide the winner. I'll take up the spot in Great Lakes if it's still available. The spot is yours - welcome! akabob2 - I'll add you as a reserve. Thank you! I will be a reserve if you need one. Great! I'll add you as well. just a heads up -- if the next round is due to start in the next 10 days -- I will be away and unable to join games until after Dec 27th. No worries, we'll take a break until the new year. Thank you for the heads up, though - much appreciated. Sorry for the delay, been a busy start to the year. Lots of very, very close games this week, plus one absolute blowout. San Francisco pulled off their first win of the season with a 35-24 upset over Puget Sound. England was not so fortunate, as they again fell to the highest scoring team in the league this week, despite putting up 42 points of their own. Will they find their defensive game before its too late? Down 31-13 at half time, Portugal mounted an incredible effort in the 4th with a 28 point binge and were just 10 yards short (twice!) of a 5th TD that would have sealed an insane comeback victory. Nonetheless, NYC managed to hang on for a 4 point victory - 46-42. Charleston stumbled into the 4th quarter having failed to score a TD for 4 consecutive quarters, but weren't content with a 2nd consecutive loss. They rallied with 3 TDs (nearly a 4th) to edge ahead of Ireland by a slim 21-18 win. Great Lakes managed 1 TD (courtesy of General Bax) in the 3rd, but was otherwise shutout and unable to contain the tour de force that was MVP Enormastitz and wepuckett, who combined for 325 yards and 6 TDs! Enormastitz convincingly takes MVP honors this week with his 240 yard, 83% completion rate and 3 TDs - the most impressive performance to date! 4 teams in a tie for 1st now. Week 5 games soon! Ireland has completely steamrolled England in the first half, racking up 56 points in just TWO quarters! England's chances of gaining their first win this week look slim. Germany turned up the heat on the Great Lakes in the 2nd, now leading 25-6. Despite racking up 35 points to edge out Puget Sound in Week 4, San Francisco has been unable to shake their season long scoring trouble, as they currently are being shutout by the Netherlands, 14-0. Portugal added 3 scores to their total to edge ahead of Puget Sound 25-6. Charleston sits on a small lead over NYC 19-7, despite several missed plays by QB lostatlimbo (*ahem*). He'll be benched moving forward to give the team backup a chance to ignite this offense. This tournament is now labeled "Needing Rescue". If it is not rescued within a week it will be considered abandoned.